We Specialize In Solid Wood Kitchen and Bathroom Cabinets! In order for us to give you a quote we will need your kitchen measurements. Please follow the instruction on "How to Measure Your Kitchen". A guide to planning and creating the heart of your home. Accurate measurements as indicated in the measuring procedure are key elements we will need to help plan your new kitchen. With this information, our kitchen specialists will be able to help design the kitchen of your dreams. Before any planning can start we must know the exact dimensions available to work with. Using the measuring procedure illustrated you can prepare a simple floor plan of your existing kitchen. 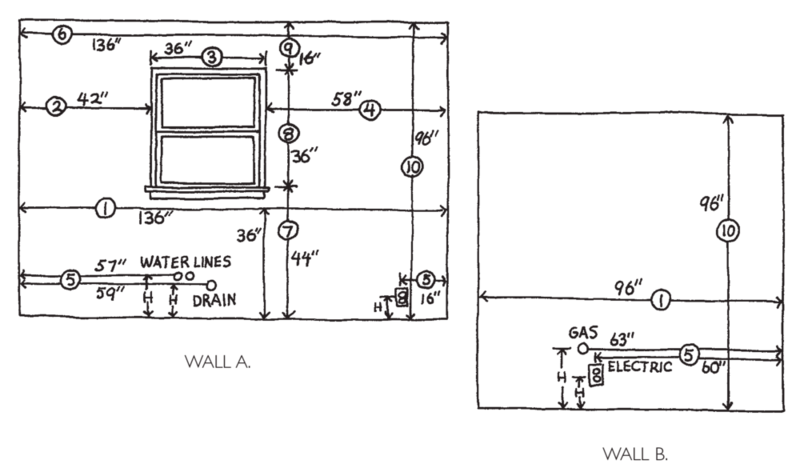 Your completed floor plan should resemble the diagram shown below. Make sure you show exact locations of doors, windows, hood vents, exhaust, gas line, water line, drains, switches, outlets, light fixtures, and heat vents. Double check all measurements. Using a tape measure and graph paper, measure as outlined below. Measure from wall to wall at 36″ height. Measure from floor to ceiling – Compare to sum of #7, #8 and #9.